If that title seems a little bit cliche then don't blame me. It's courtesy of those troublesome Scottish craft beer punks. 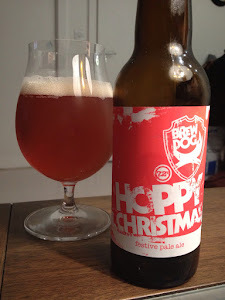 With tongue firmly in cheek, Hoppy Christmas is the name BrewDog have given to their 'Christmas Beer'. It tastes about as Christmassy as pad Thai, which is exactly what they were going for I suspect. This clean and brightly hopped 7.2% Simcoe IPA is the antithesis to the over spiced, festively pumpclipped 'winter warmers' currently clogging up your local cask lines. Look past the name on the bottle and what you get is a fantastic beer with one of the best aromas I've smelt for a long time. Massively tropical-fruity with loads of tangerine, mango, fresh pine and cut grass. The flavour is much of the same. Just classic, right on the money, back to their best, BrewDog. Mango, passion fruit, a touch of grapefruit in the finish, yet not overly bitter and hugely drinkable with a great aftertaste of juicy-yet-peppery hops, mango and fresh grass. You've got to give it to BrewDog, they really know how to get the best out of Simcoe. I actually like the 'winter warmer' beers - refreshing change from beer after beer after beer that tastes of tropical juice. It's ironic that the 'craft' revolution is so quick to decry the ubiquity of 'boring brown bitter', yet is just bombarding the market with the same kind of IPAs/Pale Ales stuffed full of citrus hops. Not that I don't like those type of beer (I love them, in fact).